Tapestry Theatre Company is on hiatus. Thanks so much for your past support. Feeling nostalgic? You can peruse these pages for info on past productions. If you want to have some musical memories of the Christmas from Home shows, we're offering "Sanna Bunnell Live!" - a CD of all Sanna's solos through the years. Email us for more details or to order a CD for $15. You can also order a CD of some of her previous recordings. Some of the Christmas from Home scripts have been produced in previous years by other companies such as Oregon Children's Theatre and Oregon City High School. 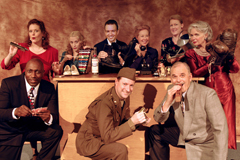 In 2015, 1941 Christmas from Home will be produced by the Ralph Radio Theatre. "May your days be merry and bright!"